The term molecular weight as it is applied to polymeric materials implies something different from what is generally meant for small molecules. This is due to the fact that a polymer sample does not have a single molecular weight but rather a range of values (See Jordi white paper “Definition of a Polymer” for more information). In a given sample there may be polymer chains which contain widely different numbers of repeat units. In fact, most polymers contain some residual monomer (Degree of Polymerization “DP” = 1) and some chains which contain several hundred repeat units (DP > 100). These molecules will differ in relative molecular mass by several orders of magnitude.For this reason, the molecular weight of a polymer is reported using averages. 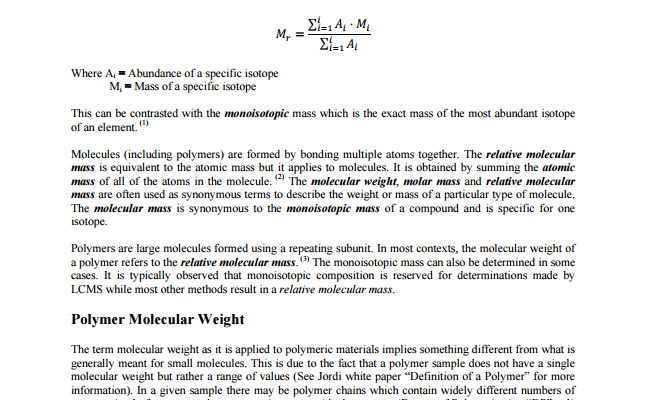 These averages are intended to describe the distribution of molecular weight values for the polymer chains. Three different molecular weight averages are commonly used to provide information about polymers. These are the number average molecular weight (Mn), weight average molecular weight (Mw)and viscosity average molecular weight. In addition, several other averages are used to lesser extents including the Z average molecular weight (Mz) and the Z+1 average molecular weight (Mz+1). Jordi Labs excels at testing materials for the various molecular weight averages that are commonly used to provide information about polymers. 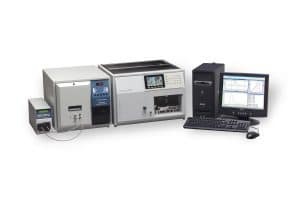 For more information on molecular weight testing, please see our GPC Testing section.